Quite possibly one of the finest wax carving and overall quality ring I've ever made. This ring was based on a green man stone carving found in the cathedral in Bamberg, Germany. The beauty of the stonework is quite unlike anything else in the immediate vicinity of the chapel and strangely modern in its esthetic. For the uninitiated, the Green man was, rather loosely, the mythological figure who represented the male regenerative force of nature in the Celtic tradition. A trickster by nature, he was want to hide. This all inspired me to make this ring and a long-time customer thought that was a fine idea. This design was my first sale on Etsy in 2009. Having been molded, it is available in sterling silver or any color or karat of gold. 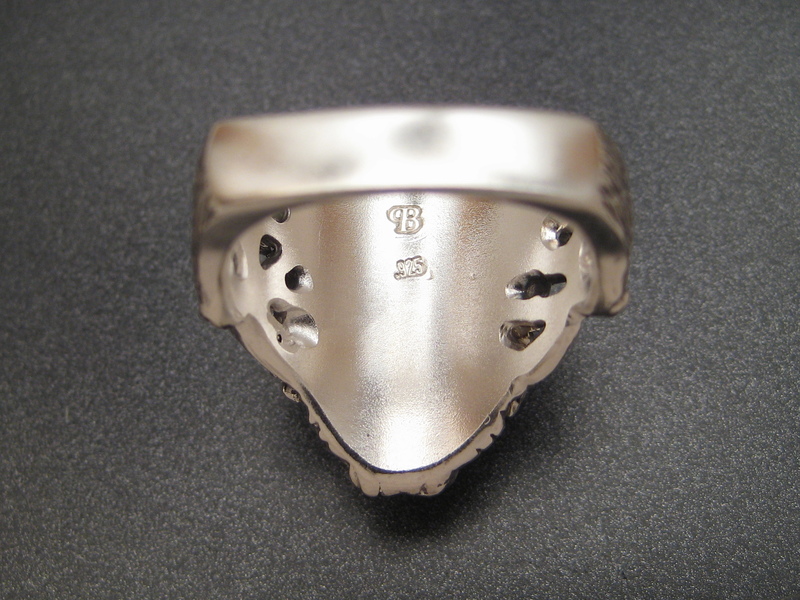 This was one of the first designs in which I utilized the square shank which helps to prevent the dreaded condition known as ring flop. My rings are never hollowed out so, as the fifth image shows, the underside of the top of the ring is solid. This helps for a number of reasons but mainly it reduces the problem with water retention that hollow rings have. Consequently, this is a massive ring weighing 19.5 grams in sterling silver and 25 grams in 14K yellow gold. The shank is six millimeters wide and the face measures 24 mm from top to bottom. Gold prices, due to the mass of the ring, would be given on the day requested.